Good morning!! How are you on this beautiful spring day? It is so exciting to get into the warmer weather. We had a 24 degree day here last week and I felt as though I was just bursting with happiness after that grey, dour Melbourne weather! How about you? What sort of things do you like to do for your health in spring? It can be a good time to get into healthier habits, because you feel so good and so energised! I actually think that we should celebrate New Years Day on the Winter Solstice in Australia. If we were thinking about our New Year’s resolutions towards the end of winter, maybe we would have a GREAT plan for action for the spring!! One for next year maybe. Let’s celebrate it!! There is definitely a green smoothie recipe for every season, and the spring green smoothie is very exciting. Fruits that are in season in spring include all those lovely berries, like strawberries, blueberries etc, as well as pineapple, papaya and pawpaw. It can be a difficult time to get really nice fruit, because it is just starting to warm up to those gorgeous summer fruits. Green leaves are in season all year round, and you can find them in abundance at your local farmer’s markets or supermarket. Without further ado, the recipe for a lovely spring green smoothie! This beautiful green smoothie will have you bouncing off the walls! 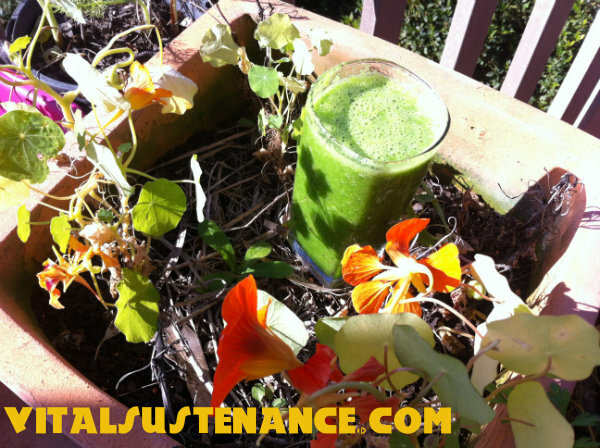 A blender full of green leaves like rocket, spinach, mesculin mix, a leafy mix or cos lettuce. (You usually need about four handfuls of leaves, or half a bunch of both spinach and cos), but experiment. The aim is to fill your blender to the brim with leaves. Add the chopped celery and two servings of seasonal fruit. Blend on high until smooth. Add the banana, lemon and herbs if you are adding, and blend on high until smooth and creamy. If you are just starting to drink green smoothies you might find that two glasses of this green juice is enough to begin with. Try and drink it slowly (I know it is delicious!) so that you don’t get bloated. You can work up to the full serving of 1.75 L of green smoothie goodness, but for the past few months, I have just been drinking two glasses a day, four days a week, as it is more cost efficient that way. A bag of leafy mix from the supermarket is about enough for two blenders full of green smoothie, and it can be expensive! This drink is very healthful! It will result in radiant glowing skin, and because it is so full of fibre, you will find that it is very beneficial to your digestion. Thanks again for all the love! There should be some interesting posts coming up, but this was just ‘top of mind’ today.